Why Join the Barber Coin Collectors' Society? 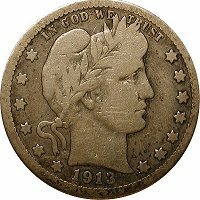 Join the national coin club dedicated to the study and collecting of the coinage of Charles Barber, Chief Engraver of the U.S. Mint from 1880 to 1917. With hundreds of members nationwide, BCCS members collect and study Liberty Head (or Barber) Dimes, Quarters, and Halves, as well as the Liberty Nickel (or "V Nickel"), along with various commemoratives. If you collect any Barber series, even by type, can you afford not to be a member?